3. This stunning dress from Pret A Portobello. I love the shape of the neck and all the little details and embellishments. Perfect Christmas party dress! It costs £63.00 which isn’t TOO bad because it could be easily dressed down with a big chunky cardigan and pumps or biker boots if you want to be a bit edgier. Its a possible contender for my work Christmas do. If you like it find it HERE. 2. I saw this and squealed like a little kid. I love it. 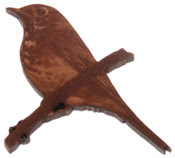 This wooden bird brooch is adorable and the wooden vintage feel makes it perfect for autumn/winter. Pin it on to anything…coats, bags, scarves. Its from Tatty Devine and costs quite a steep £23.00 for a wooden brooch. However it is too cute to resist 🙂 Find it HERE. 1. My winner this week, is this GORGEOUS sequin top from ASOS Black at ASOS.com. I love how its so slouchy and relaxed yet pretty and sparkly at the same time. Again, another contender for the Christmas do, it would look great with a black body con skirt, or skinny jeans and killer heels. However it is a little on the pricey side considering it is ASOS. It will set you back £90.00, but it’s oh so shiny! I think I will have to pass on this one. I’m sure I’ll find one in Primark :P. If you can afford it, find it HERE. So thats my Three For Thursday for this week. Today I went to The Affordable Vintage Fair which was held at my students union. It’s an event founded by a graduate from the uni I go to, which is held all over the country. There were loads of stalls with huge selections of clothing, accessories and jewellery, and being ‘Affordable’, I spent a little bit of money. Oops! Heres the link to their website if you want to go to one near you! It’s well worth a look if you love vintage fashion and individual pieces. 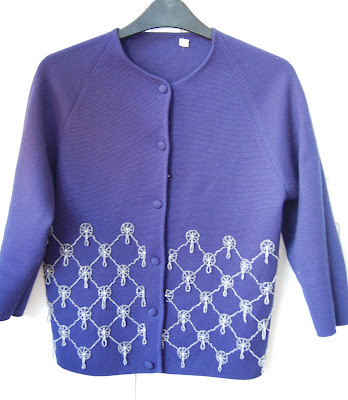 Gorgeous little vintage cardigan with beading detail. These pictures don’t do it justice. The colour is stunning and it cost £12.00. These scarves were 4 for £5.00. Bargain. 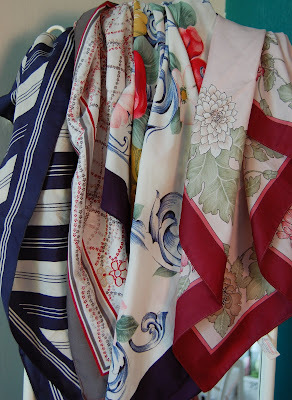 I love all the colours and patterns, great for tying onto handbags! Finally I got this beautiful cameo necklace for £6.00. 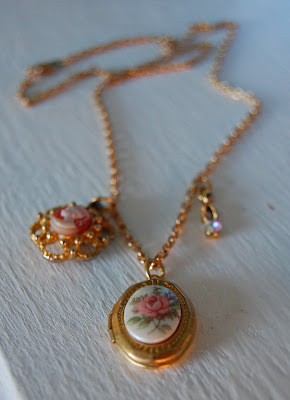 The main pendant is a locket, and then it features a cameo charm and a droplet with a stone in. As I said, a must see if you’re into vintage fashion or just fashion in general. "Told you I’d do some work…"
Love your blog. That wooden bird brooch is indeed very pretty! That sequin top is gorgeous. A little glitz never hurt anyone. I love all of those three! Your necklace is gorgeous, btw. Definitely love the top. And the necklace is also very beautiful.